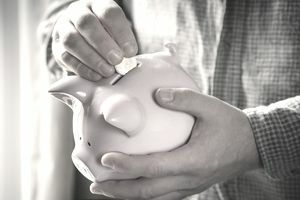 Saving money can be hard for almost anyone, but if you're already living paycheck to paycheck, or if you don’t earn much, saving might be even tougher. Are you only saving a little bit of money? Don't feel like you can afford to set aside anything at all? Here are tips that might help you save more when your budget is tight. If you’re living paycheck to paycheck, you should have a detailed line item budget. Once you eventually develop more wiggle room, you can move to a more relaxed budgeting style. At this point in the game, you need to be scrutinizing every single penny that flows both into and out of your bank account. Keep a very careful record of every single expense. You might be shocked to find out how much money you’re spending on coffee, restaurant meals, clothing, and other tiny items that you’re not even consciously aware of spending money on. These include housing, transportation, and food. If necessary, this might involve downsizing to a smaller house or apartment. That means moving out when your lease has expired, or it may even involve moving out of the house that you own, renting it out, and moving into a much more affordable rental. If done right, this will create a spread between your out-of-pocket housing cost and the rent that you are receiving. You can then stash it directly into a savings account. You should look into alternative transportation options as well. Take the bus from time to time or ride a bicycle. Bundle your errands, so you don’t need to make frequent inefficient trips. If you’re living paycheck to paycheck, it’s time to cut out all restaurant meals. Your food should exclusively come from grocery stores. When you're at those stores, cut out unnecessary items like cookies and potato chips. If necessary, go as far as cutting out meat if that’s what it takes to get your budget back on track. You don’t need to drop huge amounts of money on these occasions. It’s okay to give small token handmade gifts such as a nice card. Use an app like Digit to skim small amounts of money from your account into a savings account on your behalf. Set up an automatic transfer from checking to savings, even if it’s as small as $10 or $15 per paycheck. Getting a tax refund? It goes directly into savings. Got an extra paycheck this month or a holiday bonus? Stick it into your savings account. Anytime you stumble across any unexpected money, put it directly into savings. Impose a one-week waiting period between any purchases that you make. If you see something at the store that you like, don’t buy it right away. Go home and sleep on it. If you still want it one week later, go back for it. Most of the time you'll find that you don’t want the item any longer. Buy it only if you need it. The best deal that you can ever get is 100% off because you haven’t purchased the item in the first place. At every single day, you should be reviewing these receipts so that you can have a deep awareness of how much money you have spent on that day. If necessary, forego all plastic cards such as debit and credit cards and put your cash into envelopes. Spend only the cash that is in each envelope. If you’re thinking about buying a meal at a restaurant that will cost $15, and that’s the amount you make per hour, ask yourself if that meal is worth an additional hour of standing at a cash register or taking incessant customer service phone calls. Thinking about the time that you exchange for your money can keep your spending in perspective. Compare rates on car insurance, renter or homeowner’s insurance, and life insurance. Spend one day a year reviewing your existing policies and comparing the rates at other competing companies. You might be able to lower your premiums by several hundred dollars per year. Raising the deductible on these is also a good way to save money, but only do this once you have saved an emergency fund that would be able to cover the deductible. Follow these tips, and you may be able to save hundreds, if not thousands of dollars, every year. Can a Travel Agent Really Save You Money?